This is our specially configured ECU package that offers full tuning of the 01-05 Civic with D17A engine using the Hondata Kmanager software. 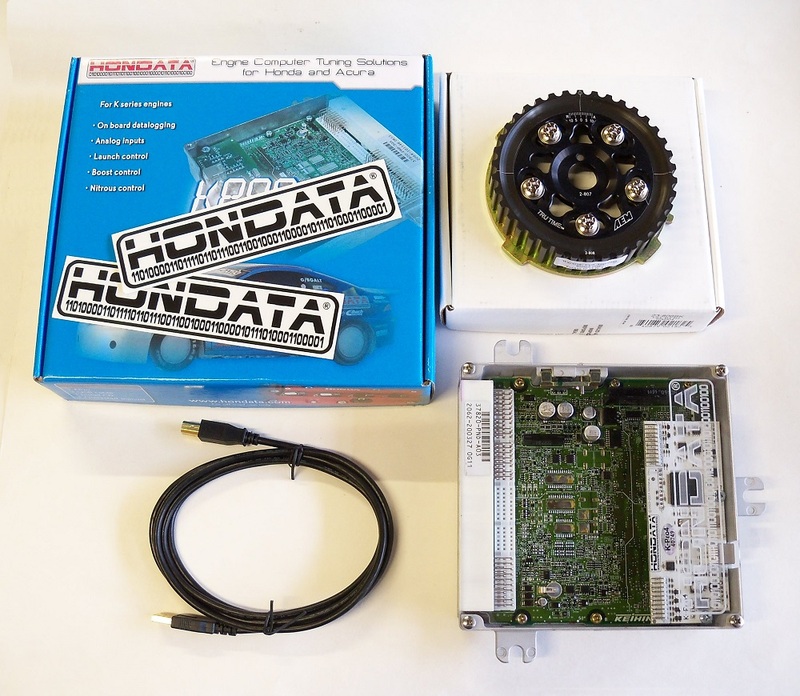 Due to the fact that the stock D17's ECU cannot be reprogrammed, Our ECU package consists of our specially modified and reconditioned RSX ECU with fully installed brand new Hondata K-Pro4 system (software included), and a specially modified by Hondata AEM cam gear for the D17 engine which allows the engine to be run by our K series ECU. You will not find a more robust tuning solution for the 01-05 civic. 2001-2005 Honda Civic DX, LX, HX, and EX with manual transmission (North America models only). AEM cam gear for D17 engines that has specially modified teeth for use with the new K series RSX ECU. Basemaps for D17 VTEC and non-VTEC engines are included within the Kmanager software to get you up and running. These Civics have a narrowband O2 sensor. The K series RSX ECU is designed to run by default with a wideband front O2 sensor. So we use a European PRA calibration, which is designed to run with a front and rear narrowband O2 sensor, feed the voltage from the Civic's front O2 sensor into the K-Pro's rear O2 sensor input, and alter the K-Manager software to run closed loop from the secondary O2 input. In this situation OBD II must be disabled.